According to a recent news report from Boston.com, a 56-year-old woman was driving her car in Somerville when she suffered what has been characterized as a medical incident. At this point, police allege she lost control of her vehicle and crashed into a Honda Civic. 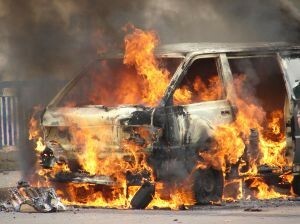 The Honda Civil burst into flames after being hit by the woman’s car. e The 26-year-old driver of the Civic was treated by first responders and then transported to Massachusetts General Hospital, a level-one trauma center in Boston. A 16-year-old boy who was walking in the area of this chain reaction car crash was hit by one of the cars involved and suffered serious injuries. He was also treated at the scene and transported to Massachusetts General Hospital. While police listed his condition as critical, they believe he will survive the accident. The driver of the Civic, a 26-year-old from Medford, was transported to Massachusetts General Hospital with serious injuries. The teen was walking in the area of the crash when he was struck by a car, according to police. He and the Somerville woman were also transported to MGH with serious injuries. Police said the teen’s injuries, while serious, are not believed to be life-threatening. The accident occurred on McGrath Highway near Highland Avenue. Police said the crash caused a chain-reaction crash with three other cars, but none of the drivers of those vehicles were injured. According to police, the crash occurred at 8 a.m., not 7:15 a.m. as previously reported. The driver who suffered the medical condition prior to colliding with the Civic was also taken to a Boston area hospital for treatment for her serious injuries. According to a spokesperson for the Massachusetts State Police, investigators determined the accident was due to the woman’s medical conditions and have not issued her any citations or placed her under arrest. While we typically use the term car accident, many motor vehicle crashes are anything but an accident. They often involve negligent conduct, which is actionable in a civil court. Even cases involving a driver who crashed due to a medical issue may be determined to be due to negligence. The main element in proving a negligence case is establishing defendant breached his or duty of care. In the case of an illness or other medical condition causing a driver to lose control of the vehicle, the question at issue is whether defendant knew of his or her medical condition and whether, if known, it was predictable that having this medical condition would make it likely there would be an accident. For example, think about a person who suffers from narcolepsy and was obviously aware of this condition. It might be considered negligent for that person to get behind the wheel of a car because he or she should know there is a chance of losing control of the car and injuring someone. Essentially, it comes down to whether a defendant is showing a disregard for the safety of others. If they are, this can be used to prove negligence.